I love this blackened rub, make it as hot or mild as you like it! 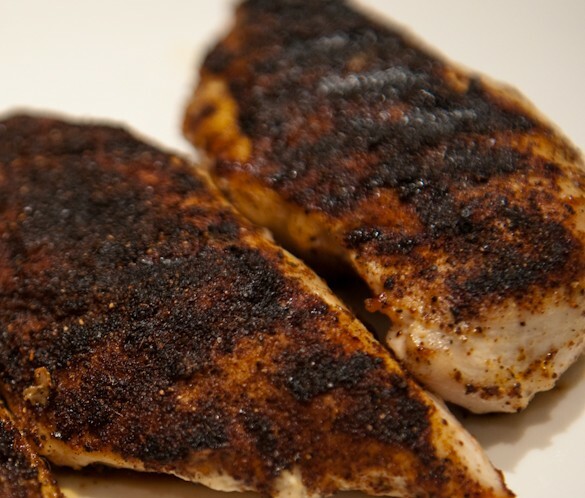 Blackened chicken is great over pasta, on salads, in sandwiches or wraps, or just accompanied by some sides on your dinner plate! Mix spices in a bowl and set aside. Clean chicken breasts and pat dry with paper towels. I like to butterfly them, so they cook faster, but leaving them whole is great! Place the chicken is a plastic bag and toss in the spices. Shake until they are well covered. Grill or bake at 375F until chicken is cooked through. I just tried this recipe, using a George Forman Grill press and it turned out really well!